Sunday, March 9th, found Marian and me at Palmer Vineyards. We were there to listen to jazz Saxophonist Brian Lenair and his friend and guitar accompanist, Jacques Johnson, Jr. Owing to LI Winterfest 2014, and jazz ambassadors Monday Michiro and Gabriele Tranchina, we have become jazz enthusiasts. We are also Palmer fans, having recently spent an afternoon with winemaker Miguel Martin and his wines. This time, we enjoyed the 2010 Merlot during the performance. 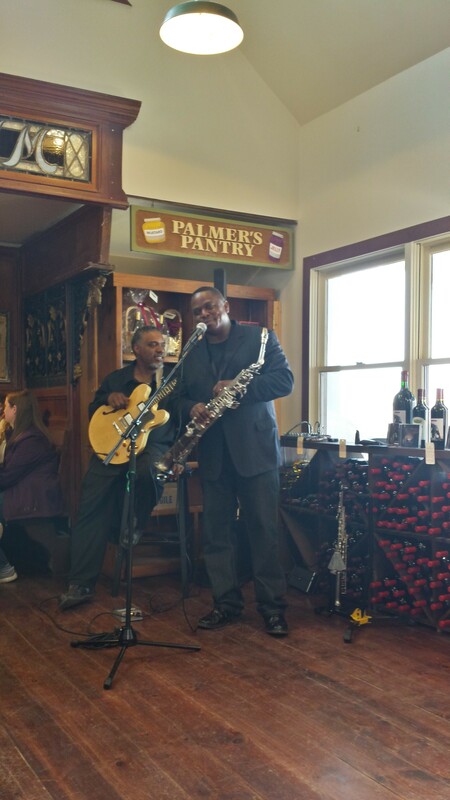 The Palmer tasting room was an ideally sized venue for Brian and Jacques. Think “intimate living room concert” and you will have the right idea. Whoever, at LI Winterfest organization, matched up performers and venues, knew what they were doing. Palmer is picnic-friendly and many in the audience brought a picnic lunch. One of the most enthusiastic eaters was Frodo, pictured left. 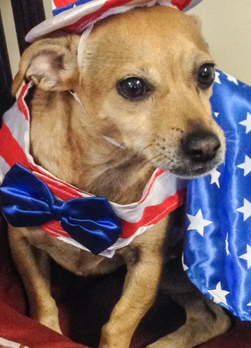 A service dog, Kent Animal Shelter representative, and jazz-lover, he was visiting Palmer with his devoted humans. I’m a sucker for small animals, and loved watching as Frodo scarfed down sausage slices and then developed an unnatural interest in a neighboring audience-member’s cheese plate. Friendly and outgoing, these gentlemen engaged the audience with anecdotes about Brian’s straight saxophones, the Washington D.C. Go Go music scene, and how their musical careers evolved. They really connected with us and the rest of the room. Did you know that saxophones were originally all straight? Curved variations made carrying and playing while seated less challenging. Who knew? There is quite a difference between watching musicians in a concert hall or large venue, and experiencing a saxophonist playing, 10 feet away. Cheeks puffed out, Brian really worked! Playing a sax is clearly not for those with a cardiac or pulmonary challenge. Jacques, playing his Epiphone 335 Dot, remained cool, collected, and an excellent foil for his musical partner Brian. During the break, Jacques told me that he and Brian had been friends for the past 20 years, playing together for the last seven. It shows, in their natural and complementary style, and in their easy and friendly interaction with the room. The performance was a super mix of Brian’s compositions and works that you and I know from our misspent youth. 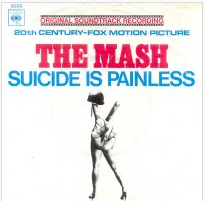 We smiled when Brian announced “Suicide is Painless”. MASH-heads will recognize the tune as the MASH theme song. 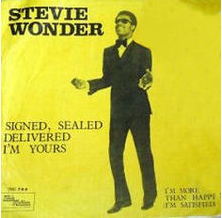 Later in the program, “Signed, Sealed, Delivered I’m Yours” got the room moving. In the intimate Palmer venue, the energy release from that number was palpable. So what did the program contain? Here it is. By the way, the (Brian’s CD) tag refers to Eye of the Storm, Brian’s 2010 album with guests Alyson Williams and Jonathan Davis. I want to thank Ronda Ward, one of Brian’s colleagues, who provided the complete playlist for me. Her comment on the list was “You all really got a treat!! !” and she was exactly right. We were lucky to have Brian and Jacques travel up from Washington D.C. for an afternoon’s performance. We hope they return to the East End for a more extended visit. Until then, we’ll enjoy his album. 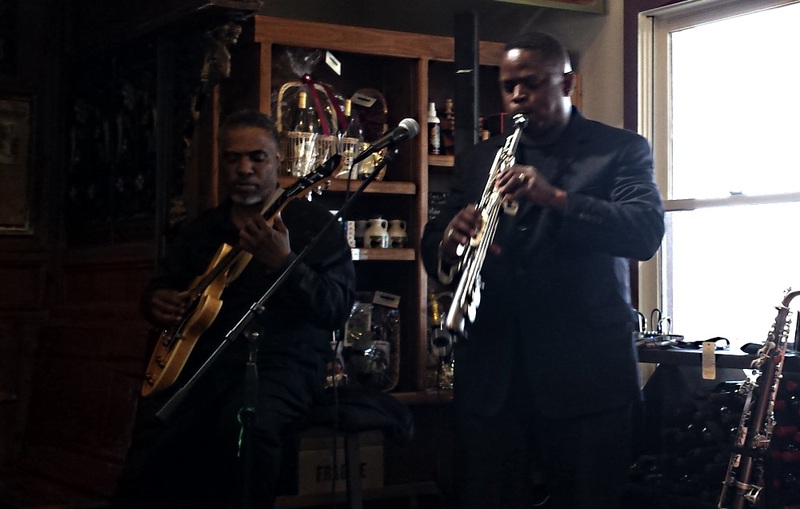 On March 15, our friend Kenny and I enjoyed the Emma Larsson trio at Pellegrini Vineyards, and we’ll tell you about that. Tomorrow, Marian and I will visit Bedell Cellars once again, to hear Buddy Merriam’s Back Roads Trio perform some Bluegrass. The North Fork Table food truck will be there, and we’re looking forward to some pulled pork. Our report will follow.